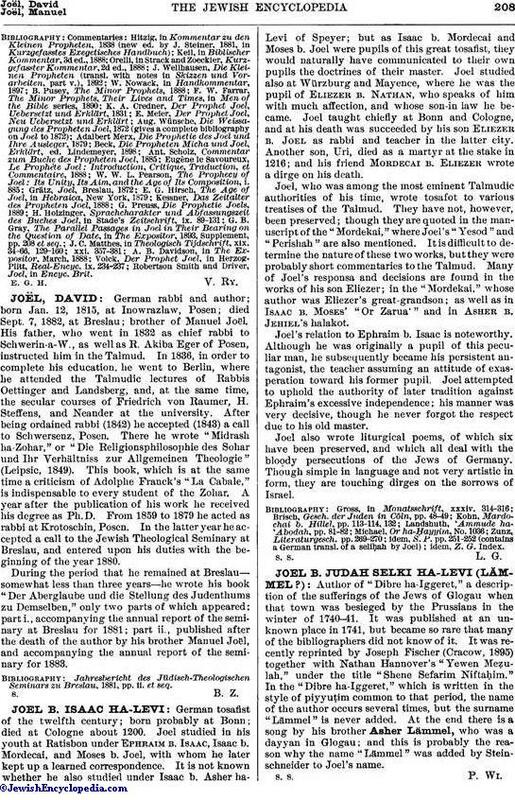 German rabbi and author; born Jan. 12, 1815, at Inowrazlaw, Posen; died Sept. 7, 1882, at Breslau; brother of Manuel Joël. His father, who went in 1832 as chief rabbi to Schwerin-a-W., as well as R. Akiba Eger of Posen, instructed him in the Talmud. In 1836, in order to complete his education, he went to Berlin, where he attended the Talmudic lectures of Rabbis Oettinger and Landsberg, and, at the same time, the secular courses of Friedrich von Raumer, H. Steffens, and Neander at the university. After being ordained rabbi (1842) he accepted (1843) a call to Schwersenz, Posen. There he wrote "Midrash ha-Zohar," or "Die Religionsphilosophie des Sohar und Ihr Verhältniss zur Allgemeinen Theologie" (Leipsic, 1849). This book, which is at the same time a criticism of Adolphe Franck's "La Cabale," is indispensable to every student of the Zohar. A year after the publication of his work he received his degree as Ph.D. From 1859 to 1879 he acted as rabbi at Krotoschin, Posen. In the latter year he accepted a call to the Jewish Theological Seminary at Breslau, and entered upon his duties with the beginning of the year 1880. During the period that he remained at Breslau—somewhat less than three years—he wrote his book "Der Aberglaube und die Stellung des Judenthums zu Demselben," only two parts of which appeared: part i., accompanying the annual report of the seminary at Breslau for 1881; part ii., published after the death of the author by his brother Manuel Joël, and accompanying the annual report of the seminary for 1883. Jahresbericht des Jüdisch-Theologischen Seminars zu Breslau, 1881, pp. ii. et seq.